Geographically, the company is perfectly located in a large port, but they suffered major problems due to the hot and humid climate experienced on the coast. Every time the transport vehicles arrived or left, the hot, humid air flowed directly in and met the 10ºC air in the dispatch area. This caused condensation and fog to form, which added to the difficulty in keeping the cold and freezer rooms free from humidity and thus, free from pools of water and the formation of ice. 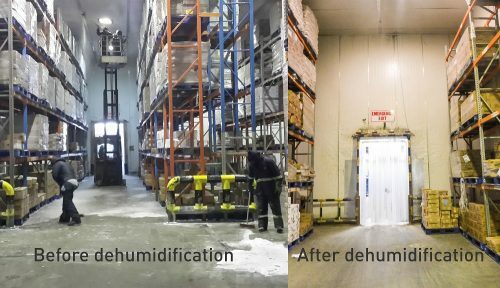 When the humidity was over 95%, the visibility became very bad due to fog, which also meant it was not possible to prevent ice from forming on the floor, walls and ceilings. The fork trucks were sliding and destroyed the premises, the electronic systems were destroyed by the humidity and the environment was generally hazardous to work in.